Dr. Tatiana DeLaurentiis, DPM offers a full array of podiatric services to help you maintain healthy feet. You can read more on this page about specific services. Ankle Sprains—caused by an unnatural twisting or force on the ankle bones of the foot, often resulting in one or more ligaments on the outside of the ankle to be stretched or torn. If not properly treated, ankle sprains could develop into long-term problems. Athlete’s Foot—a chronic infection caused by various types of fungus, Athlete’s foot is often spread in places where people go barefoot such as public showers or swimming pools. Corns—and calluses are protective layers of compacted, dead skin cells. They are caused by repeated friction from skin rubbing against bony areas or against an irregularity in a shoe. Corns ordinarily form on the toes and calluses on the soles of the feet. Diabetes and Your Feet—with a diabetic foot, a wound as small as a blister from wearing a shoe that’s too tight can cause a lot of damage. Diabetes decreases blood flow, so injuries are slow to heal. 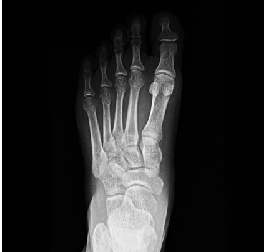 Flat Feet—are a common condition. In infants and toddlers, the longitudinal arch is not developed and flat feet are normal. The arch develops in childhood, and by adulthood, most people have developed normal arches. Don’t ignore foot pain. It is not normal. If you experience any type of persistent pain in the foot or ankle, please contact our office. Inspect your feet regularly. Pay attention to changes in color and temperature. Look for thick or discolored nails (a sign of developing fungus), and check for cracks or cuts in the skin. Peeling or scaling on the soles of feet may indicate Athlete’s Foot. Any growth on the foot is not considered normal. Alternate shoesâ€”don’t wear the same pair of shoes every day. Are you tired of your painful and deformed toes and bunions? Get helped and get more self confidence by seeing an experienced foot doctor who helps hundreds of patients per year. Dr. Tatiana DeLaurentiis is more than an average foot doctor.